Soon all young actors will be singing about their “Summer Nights,” whether or not they are performing in “Grease!” Yes, it’s that time of year when final exams are almost a thing of the past and two solid months of summer fun begins. What should parents do for young actors to make summer memorable? 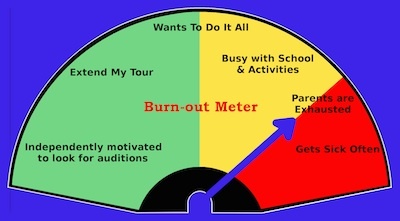 Check the “Burn Out Meter” first and then decide. Parents are exhausted. Self-care is the foundation upon which all good parenting rests. Do not give in to another extended commitment or tour even if your child seems ready to go, but you are the one who is worn out. Consider the impact of your child’s acting commitments on your other children, marriage, and career. If your child is motivated, but you need a break, consider a multi-week acting camp that gives your child focus and opportunity without your direct involvement. Give yourself a break; you deserve it! Busy with school and activities. Young actors who push off planning because they are so busy that they cannot focus beyond this week are often in danger of burning out, but may also be fine. Don’t push; network with friends and do your research to gather the options that you think will work for both you and your child. Yes, by the time the schedule dies down and your child can focus, some programs will be full; however, others, especially later in the summer, are likely to still be available. Wants to do it all. Watch out! Young actors who cannot say no may be fine now, but can spiral into burnout rather quickly. The Syracuse University BFA program, for example, only allows their students to participate in one production at a time. Whether in college or not, take a tip from them and create balance while the pressure is low, so that your young actor has perspective when schedules get crazier. The Green Zone: Make Good Choices, Then Go For It! Extend my tour. When things are going well and enthusiasm runs high, why worry? Well, consider a few things before you commit. An acting career for a young performer depends on a strong and continued desire to perform. Children do not always have the maturity to realize that the show must go on even when their desire wavers. On the professional level, six-month contracts are standard for children performing on tours and Broadway and, though less common, I have recently seen one-year contracts. Though the time commitment is shorter, the dedication required is no less on the community theater level. Be conservative; it is always better for children to leave when they are on top. Independently motivated to look for auditions. When interest motivates independent action like searching on Backstage for audition opportunities, your child is ready for more. This is what I like to see when kids work in the business or make commitments to acting camps and shows of all types. Support them and their passions whether or not it leads to Broadway or Hollywood. These kids will grow from the experience and become better people. And isn’t that what it is all about? A final word: Though I have seen many young actors show signs of stress, the vast majority who find the stage continue to act because they love it. As with all people young and old, there are times when we get in over our heads even with activities we love and cherish. Give them guidance and let them go; they will do wonderful things.